This picture was taken in Changu Narayan. 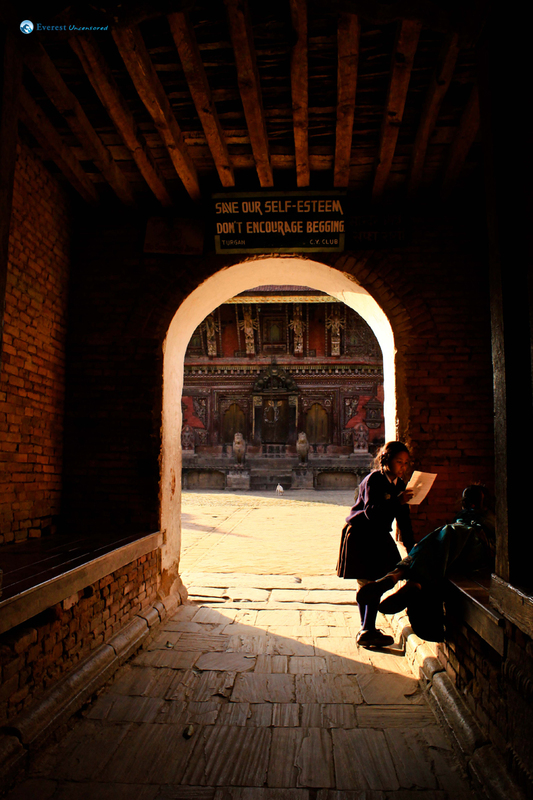 There is a girl reading to her grandmother as she lies listening to the lines recited to her, while the Changu Narayan temple stands in the backdrop. There is an air of calmness while the girl and her grandmother are unaware of the moment being captured. The alley seems dark leading to light outside, while a sign board encouraging self esteem hangs on the top. The answer is education. The picture underscores the importance of education in every corner of Kathmandu. It is the rite of passage, from darkness to light, and literacy is the key.